Open House Success Must Have! 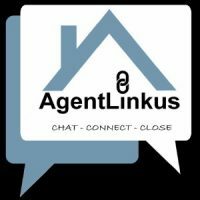 Great prospecting tool for Realtors, Agents and Brokers. Notepad Forms to Collect Buyer Feedback & Buyer Contact Info during an Open House Tour. 2 pack of 50 page notepads. REALTOR OPEN HOUSES. An affordable MUST HAVE for any Real Estate Agent, Broker or Lender to ask questions to Buyers for honest feedback and collect their contact information. A great way to collect Buyer clients and follow up with prospects. FOR SALE BY OWNERS (FSBO). If you are hosting an Open House, give Buyers a way to ask you to contact them when the Open ouse ends. Homebuyers can be hesitant to provide feedback directly to a homeowner. This is a better method of getting honest feedback. SMART BUYERS do not want to share if they are interested in writing an offer when other Buyers are present. This feedback form can be a nice way for the Buyer to notify the Agent that they would like a follow-up call when the open house is over. NOTEPADS STAY PUT. Don’t make the mistake of using single sheets for feedback that will blow around. Opening and closing doors can create wind drafts or let bad weather inside, causing a paper disaster! Keep it tidy with a notepad that is 50 pages with adhesive and a nice manila board back. HOME MORTGAGE LENDERS OR ESCROW OFFICERS. HOME MORTGAGE LENDERS OR ESCROW OFFICERS. This inexpensive gift is a nice gesture for your favorite Realtors holding a home open(while promoting their professionalism!). Additionally for the lenders who attend open houses with their favorite Brokers to present homes to the public, bringing these feedback notepads are a great help! 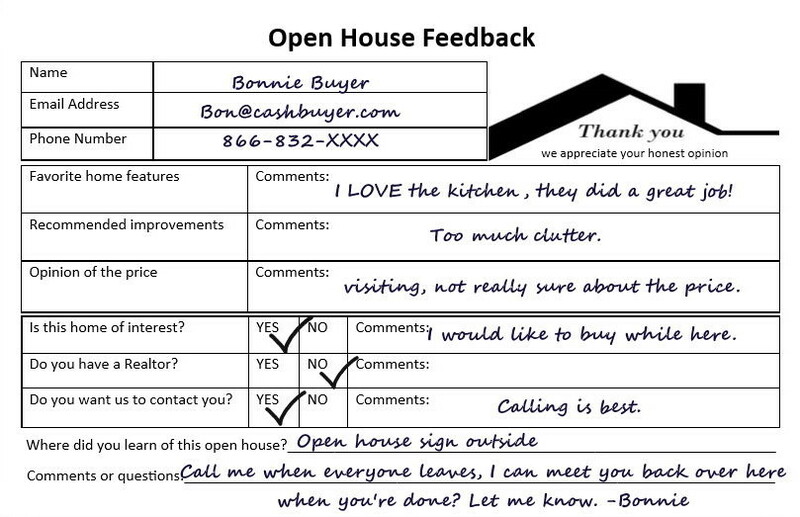 Open House Feedback Forms are ideal to collect showing feedback from Buyers after a home tour. 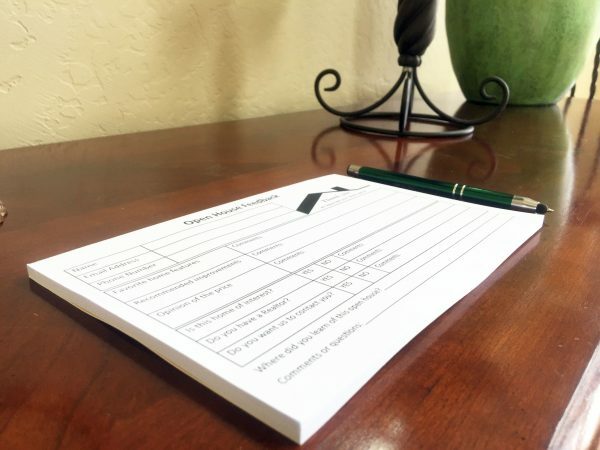 These notepads are a great way for Real Estate Agents and Real Estate Brokers to passively collect potential Client’s contact information, and showing feedback from Buyers. The showing feedback form also asks if that Buyer has a Real Estate Agent working for them, and if they wish to be contacted. Don’t waste your time pursuing those that already have a Buyer’s Agent in contract. Smart Buyers prefer to not discuss their level of interest when other Buyers can overhear at a busy open house. They will likely elect to have the Real Estate Agent or Seller contact them after the tour is over to discuss writing an offer. With For Sale By Owners, a Buyer may be reluctant to discuss their opinion of the sales price, or the condition of the home, or offer suggestions. They are much more likely to provide honest written feedback. 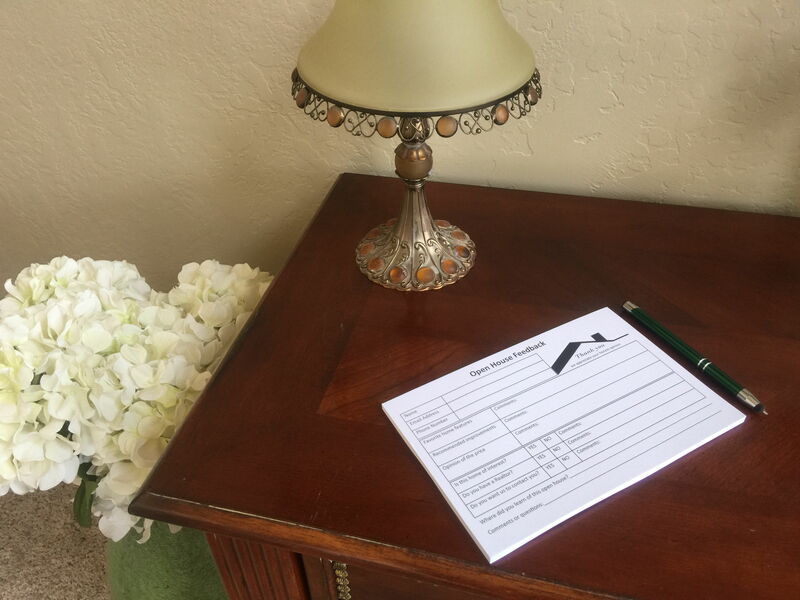 This notebook offers simple and generic questions and answers for a Seller to consider. Realtors, FSBO’s and those interested to buy or sell can all appreciate the value of this type of survey. Top producing Realtors do not just host open houses by slapping a sign up and unlocking the home, they make every effort to make them productive, in terms of collecting Buyer prospects and securing a sale for their client. 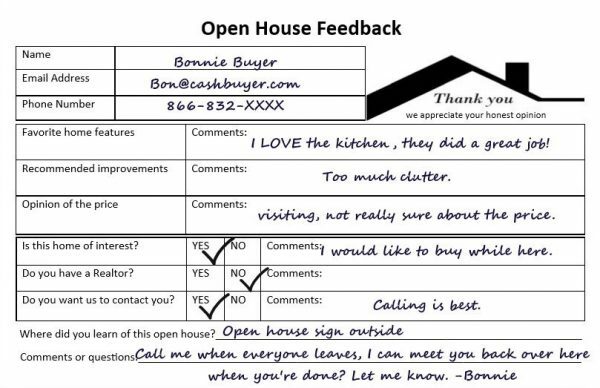 Lenders, if you are co-hosting an open house with a Realtor who is not making effort to collect prospects, do yourself a favor and bring these feedback forms!